Easy to use and comfortable to handle, the powerful COOLPIX L320 delivers excellent 16.1-megapixel photos and 720p HD videos from just about any distance. Bring even the most faraway subjects into focus with its outstanding 26x super-telephoto zoom NIKKOR ED glass lens, or zoom out and capture wide-angle landscapes and group shots that get everyone into the frame. Lens-shift Vibration Reduction eliminates the blur caused by camera shake—crucial when shooting at super-telephoto distances—and Easy Auto Mode frees you to simply point and shoot for reliably great results. No plug? No problem. The COOLPIX L320 runs on AA batteries, so you’ll never need to wait for a charge. Expand your shooting potential. Create beautiful high-resolution photos and videos with ease. The COOLPIX L320's high-performance NIKKOR glass lens is paired with a 16.1-megapixel CCD image sensor that captures bright, vibrant images you'll love sharing. Every COOLPIX is designed around a genuine NIKKOR glass lens, the legendary optics that have made Nikon famous. 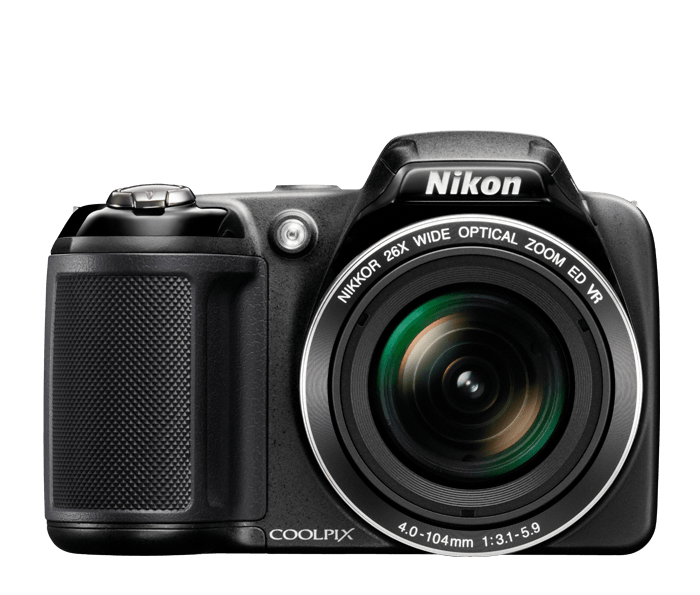 The COOLPIX L320 features a 26x zoom NIKKOR ED glass lens that takes you from wide-angle group shots to telephoto close-ups in an instant. And don't worry about a little camera shake—lens-shift Vibration Reduction helps keep the shot steady even when your hands are not. The COOLPIX L320 is so easy to use, anyone can take great photos and videos with it. Just turn the camera on, point, shoot and marvel at the results. For maximum point-and-shoot convenience, select Easy Auto Mode. It automatically optimizes the camera settings for each shot, no matter how challenging the situation. You'll be free to enjoy the moment while you capture it. Lens-shift Vibration Reduction helps keep the shot steady, even if your hands are not. Say goodbye to blurry photos, shaky videos and tripods. The COOLPIX L320 is powered by four regular AA batteries, which are convenient to use, and widely available. It accepts alkaline, lithium and Nikon rechargeable batteries, available as an optional accessory. Not sure which Scene Mode to choose? No problem! Select Scene Auto Selector and let the camera make the call. From Night Portrait to Backlighting, the COOLPIX L320 will use the best Scene Mode for your situation. Press the dedicated movie button and instantly start recording 720p HD video in widescreen format while the built-in microphone captures the sounds of the moment in high fidelity.